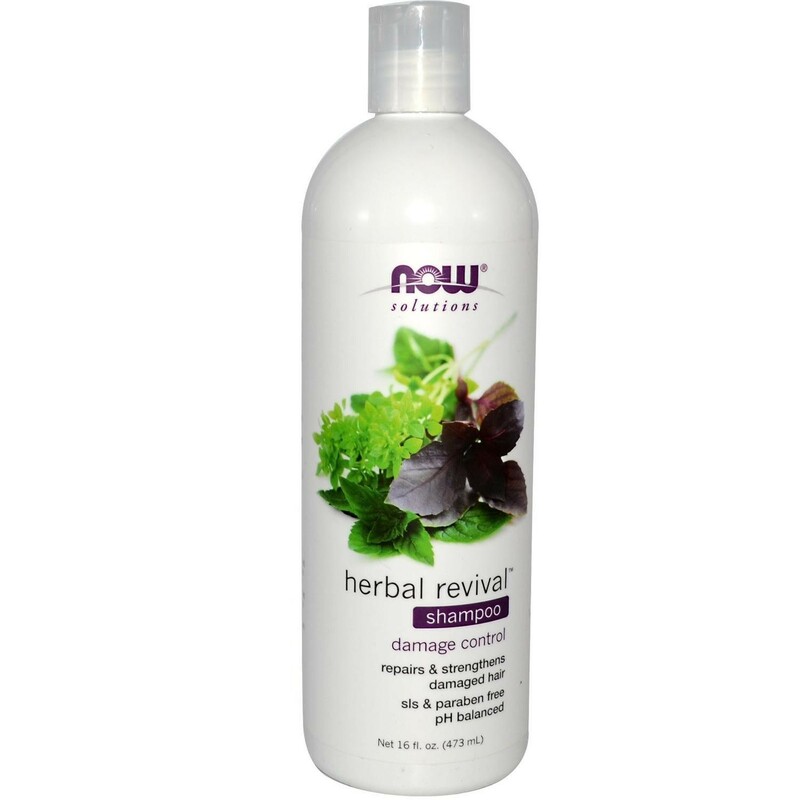 Now Herbal Revival™ Shampoo - 16 oz. Repairs & Strengthens Damaged Hair SLS & Paraben Free pH Balanced Damage Control Repairs & Strengthens Damaged Hair SLS & Paraben Free pH Balanced Condition: Damaged hair with split ends caused by blow-drying, coloring and every day styling. Solution: Herbal Revival™ Shampoo contains Horsetail Extract, Tea Tree Oil and Sea Kelp to help soothe and nourish the scalp. L-Arginine and L-Cystine strengthen damaged follicles, giving hair a healthy shine and smooth feel. Herbal Revival™ Shampoo is formulated with a unique herbal blend to protect, repair and naturally nourish your hair and scalp. NOW® Solutions is the next step in the evolution of personal care products. This comprehensive natural line encompasses anti-aging moisturizers and serums, bath and body gels, shampoos and conditioners, oral care, skin care, and essential oils, all of which are formulated with the finest functional ingredients from around the world. NOW® Solutions products avoid harsh chemicals and synthetic ingredients in all of our formulations, to provide a more natural product line. Suggested Use: Apply a liberal amount of shampoo to wet hair. Massage into hair, rinsing thoroughly. Hair will rinse clean, free of dirt and oil build up. Follow with Herbal Revival™ Conditioner to replenish and infuse natural moisture into the hair. Ingredients: De-ionized Water, Babassuamidopropyl Betaine, Decyl Glucoside, Sodium Olefin Sulfonate, Lauryl Glucoside, Aloe barbadensis (Aloe Vera) Leaf Gel*, Vegetable Glycerin, Cetearyl Alcohol, Sodium Hydroxymethyl Glycinate, Citric Acid, Herbal Extract Blend (extracts of Licorice, Calendula, Nettle, Horsetail (scouring rush), Chamomile, Lavender and Sage), Keratin and Hydrolyzed Keratin, Natural Rosewood-Green Tea Essence, d-Panthenol, Horsetail Extract, Sea Kelp Extract, Geranium Extract, Hydrolyzed Wheat Protein, Hydroxylated Soy Lecithin, L-Arginine, L-Cystine, Hydroxyethyl Cellulose, Jojoba Oil, Vitamin E (as mixed tocopherol), Tea Tree Oil, Green Tea Extract, Vitamin D2 (as ergocalciferol), Biotin, Niacin (as niacinamide), Vitamin A (as retinyl palmitate) and Vitamin C (as sodium ascorbyl phosphate). *Certified Organic Extra Foam Doesn't Mean Extra Clean! Free of abrasive ingredients that strip hair of its natural moisture and shine. NOW Foods does not test on animals.